When I was asked to write about Nikola Tesla, I hardly knew the name. As a child, I remember visiting a local science museum and of being fascinated by something called a “tesla coil,” a large mushroom shaped apparatus that made sparks and lightening. I assumed that Tesla was some kind of inventor but I wasn’t sure how the machine that made lightening and sparks was important to anyone outside of the science museum. When I learned that Nikola Tesla invented the radio, and not Marconi, I was shocked. Tesla also invented the electric generator, the electric motor, fluorescent lighting, alternating current (AC) and devised the technologies that generate and deliver our electrical power for our homes, schools and factories. So why didn’t I ever learn about Tesla in school — the same way I learned about Thomas Edison, Marconi and Einstein? The story about Nikola Tesla is the story of a genius who was largely disrespected and abused by other scientists and inventors — many of whom stole his ideas and took credit for his discoveries. But how did this happen? Born to a Serbian family on July 9th, 1856 in Smiljan, Croatia (former Yugoslavia), Nikola Tesla was a dreamer with a poetic touch. His first “invention” consisted of a rotary engine, powered by insects that the young Tesla had glued to a paper wheel. This boyhood fascination with motors developed a unique mental ability where Tesla could visualize inventions in his mind, complete to the most minute detail, and execute these plans without the need for a blueprint or meticulous calculations. As an adult, Tesla attended the Technical University at Graz, Austria, and the University of Prague. At Graz he first saw the Gramme dynamo, which operated as a generator and, when reversed, became an electric motor, and from this observation he conceived a way to use alternating current to advantage. 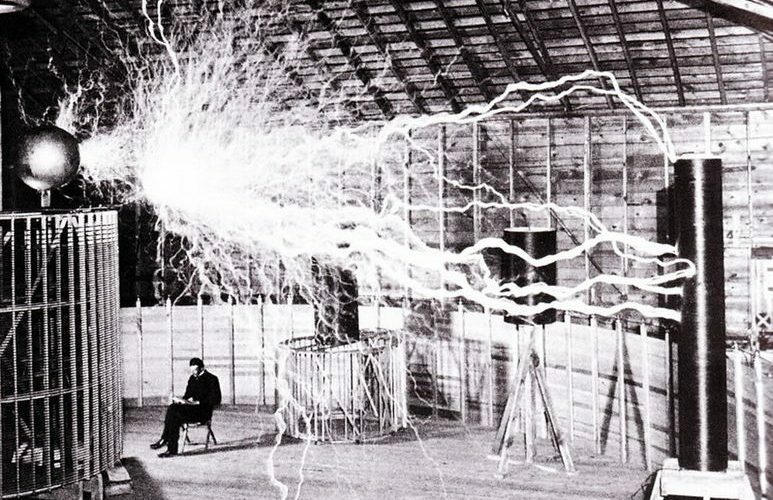 Tesla had a vision of electromagnetic fields that was real and tangible, at a time when most engineers considered electrical current as an intangible and ethereal mystery. Later, at Budapest, he visualized the principle of the rotating magnetic field and developed plans for an induction motor that would become his first step toward the successful utilization of alternating current. An eccentric genius, Tesla had few friends and remained reclusive. He never had a home in America, choosing instead to live in hotels. During the final few decades of his life he withdrew in a New York hotel, only granting interviews and making annual public appearances on his birthdays. At these press conferences Tesla proposed future inventions, but his accounts were frequently distorted by the popular press. After Tesla’s death the Federal Bureau of Investigation took note of Tesla’s proposals for advanced weapons systems and searched his papers for information about reports of his death ray machine as world conflict was impending. Tesla’s discovery of the rotating magnetic field produced by the interactions of two and three phase alternating currents in a motor winding was one of his most significant achievements of the century, and formed the basis of his induction motor and polyphase system for the generation and distribution of electricity. In 1882, before his arrival in America, Tesla went to work in Paris for the Continental Edison Company, and, while on assignment to Strassburg in 1883, he constructed, in after-work hours, his first induction motor. Tesla sailed for America in 1884, arriving in New York, with four cents in his pocket, a few of his own poems, and calculations for a flying machine. He first found employment with Thomas Edison, who had been his first employer in Paris, but the two inventors were far apart in background and methods, and their separation was inevitable. Tesla continued to work on his inventions, and seizing a momentous opportunity, George Westinghouse purchased some of Tesla’s patents in 1888. For a mere $60,000($5,000 in cash and 150 shares of stock), Westinghouse acquired the patent for Tesla’s polyphase alternating current technology. Tesla’s reputation spread when Westinghouse won the contract to supply the Chicago World’s Fair of 1893 with electricity. In 1895, the Westinghouse Electric & Manufacturing Company and General Electric Company joined forces to harness the power of Niagara Falls with electricity, using Tesla’s technology. Tesla’s generation of electricity resulted in what is known as alternating current, or AC. In alternating current the polarity and strength of the energy is continuously changing or alternating. Prior to Tesla’s innovation, the Edison company was promoting direct current, or DC, as a safer way to power both homes and factories. In fact, Edison, despite knowing that Tesla’s AC was superior, mounted an ugly publicity stunts designed to discredit Tesla and to save Edison’s own financial investment in DC. Animals were brutally electrocuted with AC, including an elephant, which were recorded by Edison and shown at public gatherings. Edison embarked on a number of propaganda campaigns which attempted to persuade the general public that AC was dangerous. Nicknamed the “death current” by Edison, public demonstrations were staged in which animals were brutally electrocuted with AC, including an elephant, which were recorded by Edison and shown at public gatherings. Despite the public’s fear of AC, Tesla had the upper hand. Direct current was good only for short distances. The accumulated resistance in metallic wires and cables greatly reduced the electrical power as it traveled through the transmission lines. AC, on the other hand, did not suffer the same loss and was able to travel great distances with little loss of potential. Also, because alternating current could react with coils of wire (transformers) to increase or decrease the voltage, electricity could be produced at high power levels at the generation stations and then reduced just prior to being distributed locally. Eventually, Edison lost his battle and alternating current became the electric industry standard. To this day, the three-phase form of Tesla’s polyphase system is still used for the generation and transmission of most electricity. Moreover, the conversion of electricity into mechanical power is made possible by updated versions of Tesla’s three-phase and split phase motors. Tesla’s experiments with high frequency and high potential alternating currents resulted in the development of the “Tesla coil.” This device is a transformer with an air core that has both its primary and secondary tuned in resonance. As part of other experiments Tesla also developed the precursors of modern neon and florescent lights. He constructed these lights, elongated glass tubes filled with gas and coated with phosphor, excited in his high voltage experiments. He also discovered that high voltage current could be made harmless by using an alternating current scheme at very large frequencies. Returning to New York in 1900, Tesla began construction on Long Island of a wireless world broadcasting tower, with $150,000 capital from the American financier J. Pierpont Morgan. Tesla claimed he secured the loan by assigning 51 percent of his patent rights of telephony and telegraphy to Morgan. He expected to provide worldwide communication and to furnish facilities for sending pictures, messages, weather warnings, and stock reports. The project was abandoned because of a financial panic, labor troubles, and Morgan’s withdrawal of support. It was Tesla’s greatest defeat. In 1943, the Supreme Court granted full rights to Tesla for the invention of radio, nullifying the claims of Marchese Gugliemo Marconi who had patented a two-tuned-circuit design and a more practical four-tuned-circuit modeled after Tesla’s. Marconi’s patent on the invention of radio was overturned by the U.S. Supreme Court because Tesla’s work predated it (Case #369, 6/21/43). Marconi did succeed in beating Tesla as the first person to send a wireless telegraph across the Atlantic, which prompted Tesla to remark, “Let him continue. He is using seventeen of my patents.” In addition, Tesla’s 1903 patents 723,188 and 725,605 contain the basic principles of the logical AND circuit element basic to all computers. Tesla also envisioned a way to send electricity through the air and through the Earth so that electrical power would be available everywhere, even in remote corners of the planet. This technology, which was only understood by Tesla himself, was incorporated in another famous experiment in 1908, where Tesla attempted to remotely light up the sky over the North Pole as a way of demonstrating this wireless power transmission technology to the world. At the time, Admiral Peary was leading an expedition to the Arctic and Tesla hoped that Peary would report on the phenomenon when he returned. Many believe that Tesla’s experiment that evening caused the world’s largest man made explosion in the remote Siberian village of Tungusta. If Tesla’s power beam really did accidentally cause the Tungusta explosion, then we witnessed the first experimental use of the same weapon system has been developed by the US Department of Defense in Alaska’s remote Poker Flats area, just North of Fairbanks. Although the capacity for destruction in Tesla’s primitive prototype (some estimate equal to a large hydrogen bomb) was huge, this new military system is almost surely many magnitudes greater. Also, many similar systems have been deployed in a dozen specific locations around the globe — presumably to be operated together for some undisclosed purpose. One can only hope that this new technology will be used for a peaceful purpose and that it will bring the respect for Tesla that has so far eluded him.